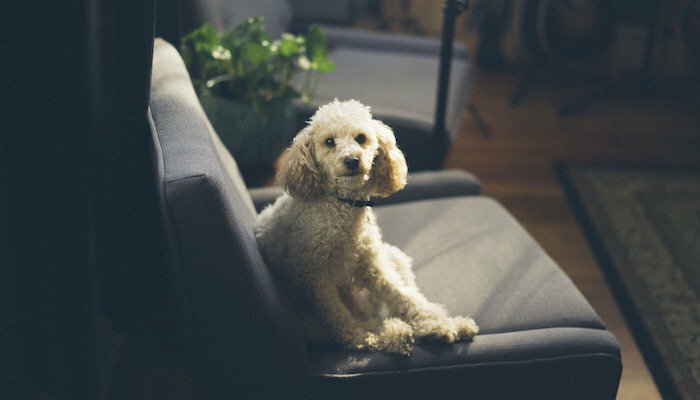 What to Look for When Buying an Orthopedic Dog Bed? What are the Benefits of an Orthopedic Dog Bed? Dogs, which are medium to giant-sized will most likely suffer from bone or joint issues. The most common issue among them being arthritis or hip and elbow dysplasia. Aside from giving your dog the proper diet to help combat these issues, there are orthopedic beds. We treat our furry pals well because they are members of our family. When we hit a certain age, we may need orthopedic beds, and apparently, dogs do as well. 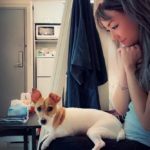 Whether it be because you no longer want to see your dog in pain as it gets up in the morning, or you just want to give it the best bed possible, you need to know more to make the best decision. When you pick out a bed, a long process entails. You start by lying on 10-20 beds at a time trying to figure out which is right for you. The best orthopedic dog beds allow your dog to rest comfortably and wake up feeling refreshed and energized after a good night’s sleep. You might also like: Elevated Dog Beds. This is a 5-inch thick dog bed that cushions your dog’s pressure points. 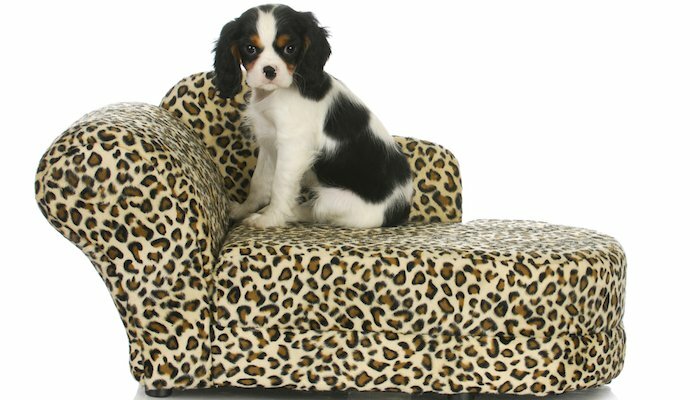 Canines with arthritis and other bone and joint issues can rest comfortably on this soft surface instead of the couch! The cover is durable and the waterproof lining will protect the bed from any liquids. The skid-proof bottom will add protection and hold its position when your dog struggles to get up. This sleek design fits into any tight space, at the foot of your bed, or anywhere your dog wants to lay. Better World Pets donates 10% of their profits to the Humane Society of the United States. Feel good about your purchase and help animals around the US. Why We Like It – It comes with a guarantee! If your dog isn’t taking to the bed, Better World will give you a full refund no questions asked! The 100% memory foam fill will treat your dog right. The arms around this bed are pre-loaded into the fabric cover. All you need to do is insert the memory foam base and zip to close. The 12-month warranty only covers parts that break due to manufacturer defect. To keep this bed clean, just remove the cover and throw it in your machine. Find the perfect size for your pooch from the four available sizes. 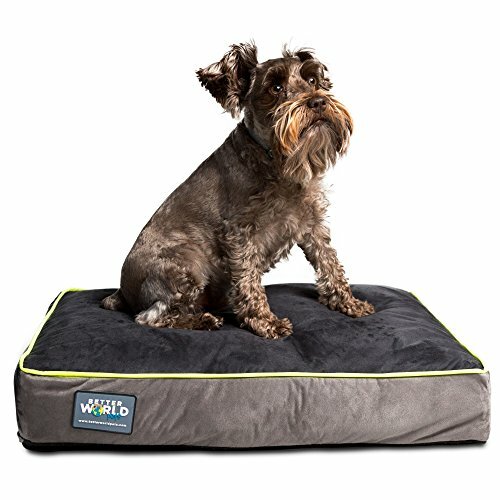 The solid 4-inch memory foam base gives your dog superior comfort by cradling its body and providing a cushion for its joints. The ‘green’ bolsters (arms) are filled with recycled material and the 3 available colors blend in perfectly with any interior. Why We Like It – The cover is water and tear resistant with a non-skid bottom. PetFusion also makes a matching blanket and replaceable cover options are also available. 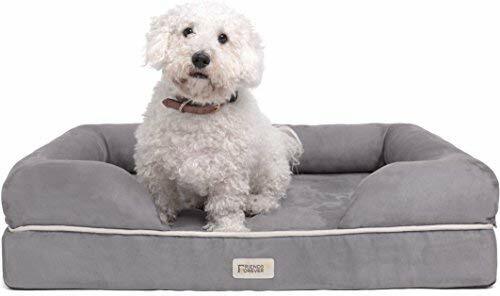 This four-inch orthopedic dog bed consists of 2 inches of memory foam and another 2 inches of high-density support foam. The breathable waterproof layer beneath the cover protects the memory foam. Nothing will get through! To keep it clean, the cover can be easily removed and thrown in the wash. 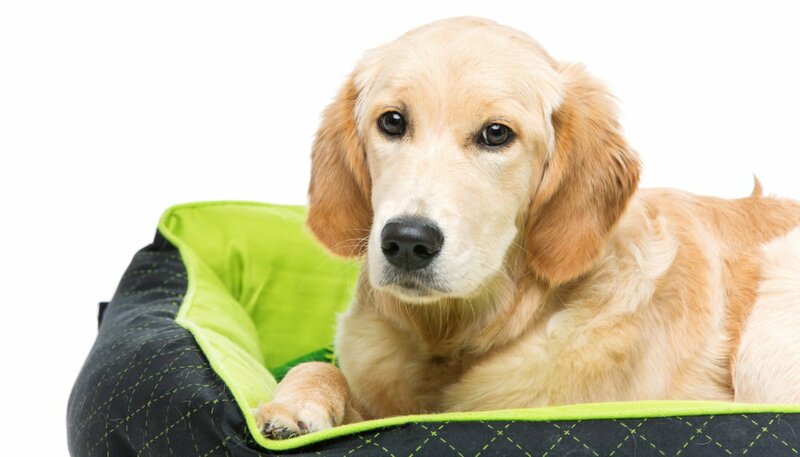 The non-skid bottom keeps the bed in place, which gives your pet full support as it rises. 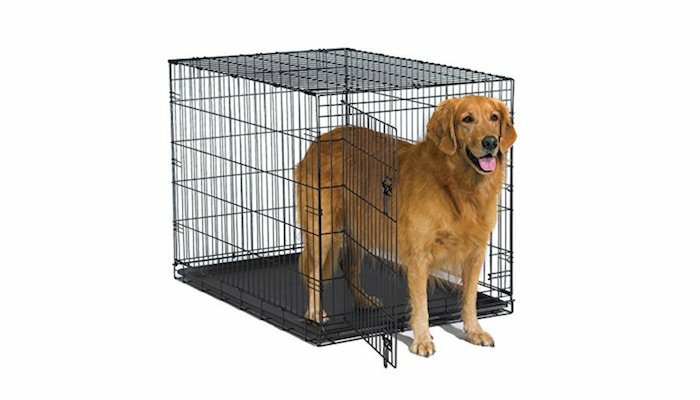 The three sizes available are designed to fit into any dog crate. This design is resistant to everyday wear and tear but unfortunately, it cannot withstand your dog’s powerful jaws. Find the color and pattern you like and click ‘order’ today! 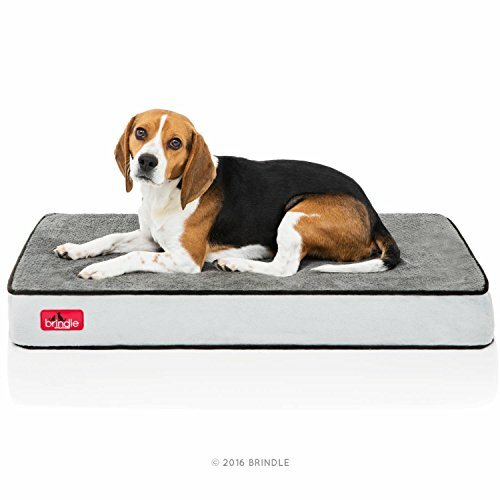 Why We Like It – Another brand that does their part to help animals, Brindle donates a dog bed to their local Humane Society every day! Every animal in their shelter sleeps on an orthopedic dog bed! The sturdy foam base with the memory foam layer provides the perfect combination of support and comfort. The superior quality materials will not flatten over time. Your dog may suffer from incontinence as it ages, and the waterproof cover is easily washable, dryable and won’t shrink. The zipper runs along two sides to make it easier for you to remove and put back on. The non-slip bottom grips the floor for maximum support and safety. These orthopedic dog beds were made with your dog’s comfort in mind, and to provide them with the best sleep possible. Why We Liked It – The high-quality foam will contour to your dog’s body for comfort and support. Slip it into your pet’s crate if you’re traveling to give them good sleep everywhere they go. 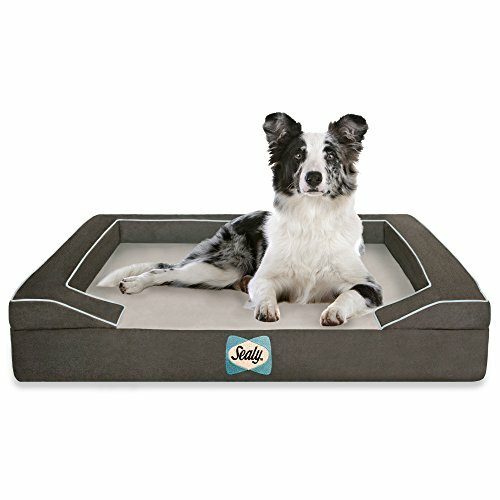 This bed is great for one dog or multiple little dogs. 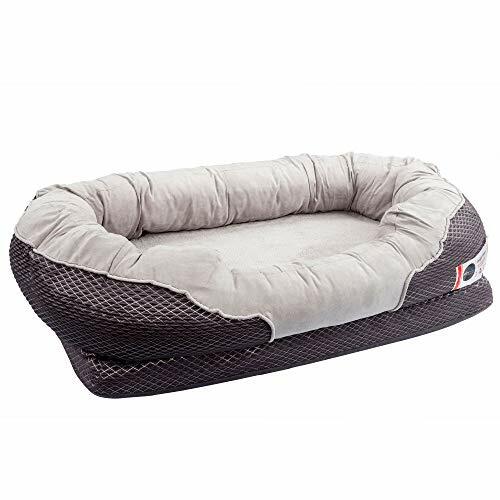 Crafted with supreme workmanship and premium materials, this orthopedic dog bed is perfect for any dog, whether they have joint problems or not. The materials used include a polyester cover with a quilted design that can be machine-washed. The grooved orthopedic foam base is ideal for reducing joint pain and the cushion provides constant support and decompression for your pet’s spine. Easy to assemble; simply insert the orthopedic foam into the base of the bed and zip to close. The non-slip rubber bottom will prevent the bed from moving on hardwood or tile. Why We Like It – 3.5 inches of orthopedic foam, this dog bed has a full 1.5 inches more foam than the average design. This is ideal to reduce joint pain and improve mobility for older dogs. The raised ends of this orthopedic dog bed provide height and cradle your dog. Plush fabric is more comfortable than the average polyester and cotton blend, your dog will love the plush embrace! As all foams do, it contours to your dog’s body and provides full-body support. The medical-grade foam will restore your pet’s sleep cycle so he/she can finally get some peaceful shut-eye. This certified foam core is easy to spot clean. The durable cover can be easily unzipped, removed and machine-washed. The assortment of colors allows you to make a choice that fits in with your interior. Why We Like It – The contoured design’s sole purpose is to cradle your dog’s body and support their spine and joints. 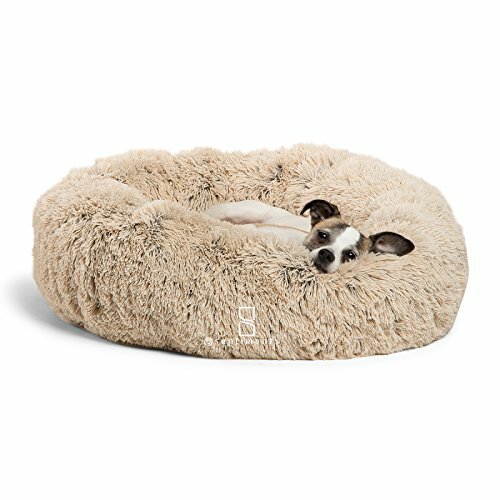 This therapeutic dog bed is extra soft with a plush surface. Not only is the outer layer washable, but the inner layer is as well. Because elderly dogs benefit more from orthopedic beds, incontinence and accidents are more likely to happen. The premium grade foam and support foam are tested by experts to make sure they provide the comfort of a 5-star hotel for your pet. Fitting and molding perfectly to your dog’s outline, the medical grade therapeutic support will give your dog a sound night’s sleep. Not only is this bed great for elderly dogs, but all dogs would be able to enjoy this luxurious and comfortable bed. Why We Like It – Don’t worry if your dog is a chewer. This company carries extra covers if your dog does happen to tear through it. Your pet’s comfort and health is a top priority. Friends Forever focus on giving your dog a good night’s sleep. The bolsters are plush and cushioned to give your dog exceptional comfort. The liner and mattress foam have been rigorously tested and proven to be tear resistant. Providing great head, hip, and spinal support, Friends Forever has a 100% satisfaction guaranteed policy covered by a limited 1-year warranty. They stand behind their product and promise high-quality. Remove the cover by unzipping to wash. The cover is fur and hair resistant, trapping stray hair from roaming all over your house. 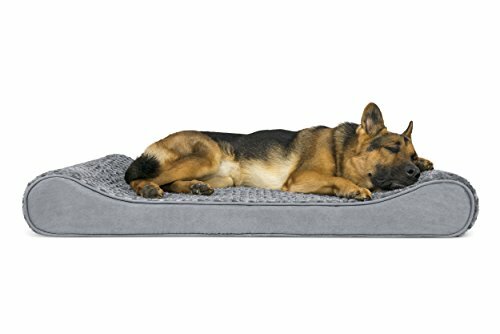 Why We Like It – Give your dog the good night’s rest it deserves with this human-grade mattress foam dog bed. It’s fully resistant to your pet’s roughhousing and will not tear. This bed is a cheaper option that even we want to get for ourselves! The round shape is great for pets that love to curl up. The rim is raised to provide neck and head support and the soft filling provides pain relief for dogs with joint problems. The faux shag fur is extremely soft to the touch and has deep crevices that allow your dog to burrow and snuggle into it. Restful sleep means a happy and healthy dog! The cover is seamless in neutral colors that mix with any interior. The bottom is water and dirt resistant to protect your floor against any accidents. Why We Like It – This donut design is great for pooches that love to burrow and snuggle. Superior comfort gives them relief from joint pain and leads to optimal health. You might be unfamiliar with quad-layer technology. This bed has four layers to the mattress. First, there’s a cooling gel layer, which regulates body temperature to prevent your dog from overheating. 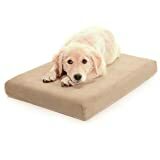 Next is the pet rest memory foam that contours to your dog’s body for support. 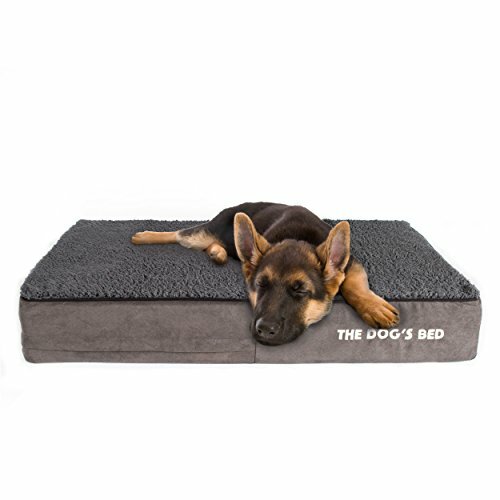 The orthopedic foam them eliminates pressure points by evenly distributing your dog’s weight across on the bed. And the last layer is an HD foam base. This charcoal base gives an extra layer of support and absorbs any odors. With so many intricate layers, this dog bed is still machine washable and perfect for dogs of all ages. Why We Like It – With this design, your dog will be sleeping on a bed better than yo! But only the best is given to our pets, right? This dog bed is unmatched in craftsmanship and design. If you’ve ever laid on memory foam or orthopedic bed, you’ll know how it feels to have all the pressure eliminated from your joints and spine. Although a simple and softer bed could help with the pain and pressure points, they don’t give enough support to the spine. The same is true for dog beds. Orthopedic beds find the perfect balance between softness and comfort and support. But what are the key factors we should look for when selecting a dog bed for our beloved pets? Read on as we take you through what to look for. It’s important to look at your dog before you buy a dog bed. How your fur baby sleeps, its weight, age and how often he/she will have accidents are things to consider when looking at an orthopedic dog bed. These are all things that will affect the size and material you choose. Even weight distribution is vital for dogs that suffer from bone and joint problems. The best foam to distribute weight evenly is memory foam. Make sure you find a bed that has a full solid piece of memory foam, and not a bunch of leftovers pieces combined together to make one piece. Many models will have memory foam and other foam layers, this is not necessary, but it is ideal. Make sure there is at least a 2-inch layer of memory foam to give your dog full support. Just like us, when selecting a bed for your dog, their size is a huge contributing factor. Generally, the heavier the dog, the thicker bed it needs. The material matters too. Four-Inch memory foam will definitely be more comfortable and supportive compared to a thicker blended material. For those of you who own memory foam mattresses, you’ll know you need to accommodate you and your spouse’s weight. If you have more than one pooch sleeping on this dog bed, make sure you find one that caters to their different needs. For obvious reasons, choose a bed that is big enough for your dog, but not one that will seem endless for him. If your dog likes to curl up, a smaller bed may suffice. 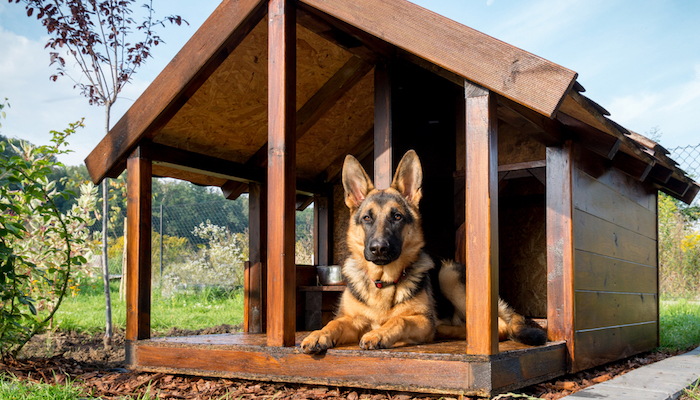 If your pooch is a sprawler, make sure you get one that gives enough space. The bed you choose will need to provide excellent support to all areas of the body. You may want to look into large dog beds for bigger breeds. Definitely choose a waterproof option that’s easy to clean. By easy to clean, we mean the cover is removable and machine washable. 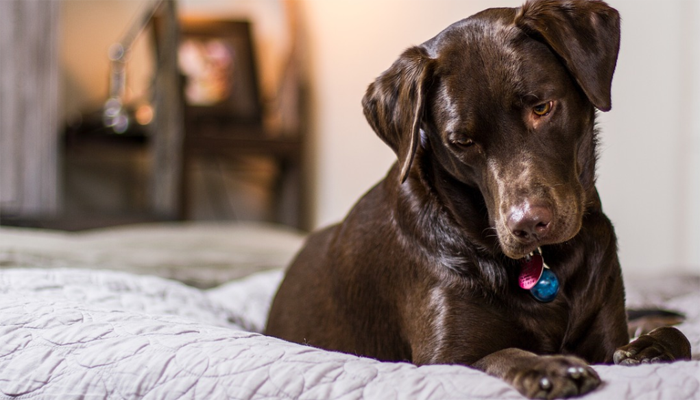 Whether or not your dog soils the bed, spills could happen and dog beds need to be cleaned. If accidents happen more often than not, a waterproof cover is a good added feature. Many dogs need to get comfortable and ‘nest’ before they sleep. This means they scratch, burrow and circle before they finally lay down. Even though this seems harmless, but any sort of prolonged period of scratching or biting could ruin the cover of the bed. Make sure the material is durable and tear resistant if possible. These beds are arguably better beds for dogs and humans alike. They are expensive for sure, and you want to make sure you aren’t just throwing money down the drain. If your pet is young and lively, an average bed could be okay, especially if they sleep wherever they want. As your dog ages and you start noticing he shifts a lot in his sleep, a better bed is a good investment. And of course, if your dog has joint issues, an orthopedic bed is a must. To answer this question in one word: support. The foam core of orthopedic dog beds is able to mold and contour to your dog’s body and alleviate painful pressure points while offering maximum support. Memory foam contours to your dog’s body temperature to create a perfect silhouette. Orthopedic foam provides extra support, and egg crate foam keeps your dog warmer in the winter and cooler in the summer. Again we are faced with a wide range of choices. Make sure the bed you purchase is the right size, material, and thickness for your pooch. Definitely choose a high-quality foam because a bed is something you shouldn’t skimp on. You will thank yourself for choosing a washable outer layer when it comes time for a cleanup. Set up the bed in a draft-free and cozy spot in your home, your dog will thank you for it. Donut beds are best for pups that like to curl up and rest their heads on the bolster. A mattress type bed is best for pets who like to sprawl out. There is no legal definition of ‘orthopedic’ when it comes to dog beds. Just make sure the foam contours and supports your dog’s body and distributes their weight evenly.